So that's it - the A-Z Challenge is complete. I don't know about you but I could do with a rest now! 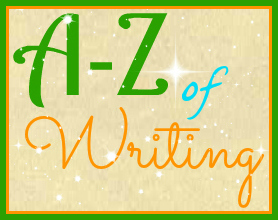 This was the first A-Z Challenge I've taken part in and it was a lot of fun, though far more difficult to think of what to write for some letters than I thought (and I may have had to resort to a teeny weeny bit of cheating). I met lots of new bloggers along the way and I'd like to thank everyone who visited my blog and commented. I hope I've replied and visited blogs in return to all - that was my aim but it did get a bit hectic on some days! Thank you for flitting. My posts appreciate it (as do I). Well done for completing the A-Z, sadly it is a lot of effort and people rarely go back to look at past posts, but it must have been great practice for writing! Thanks. It was my first time participating. It was exhausting but a lot of fun. COngratulations on completion! Get some rest. I do need a rest! I never imagined it would be so tiring. It was great fun, but it is over now and I agree, I could do with a rest as well. I think you did really great. I may have recovered by next year's challenge!